U.S. EPA chief Scott Pruitt is expected to roll out plans soon to restrict the agency's use of science in rulemakings, pitting him against critics who say it would threaten public health and environmental protections. In a closed-door meeting at the Heritage Foundation on Monday, Pruitt told a group of conservatives that he has plans for additional science reform at the agency, according to multiple attendees. EPA hasn't formally shared details of the plan, but it's widely expected to resemble an effort that Republican lawmakers and conservative groups have been pushing for years. It's been met with staunch resistance from Democrats and many scientists. The plan could come "sooner rather than later," said Steve Milloy, who served on Trump's EPA transition team and attended the meeting at the Heritage Foundation. EPA did not respond to a request for comment. And Milloy cautioned that he did not know the specifics of the plan and said he was not authorized to discuss the meeting. The initiative is expected to require EPA — when issuing rules — to rely only on scientific studies where the underlying data are made public. It's an idea that House Science, Space and Technology Chairman Lamar Smith (R-Texas) has been championing for years. He and others argue that EPA has been crafting regulations based on "secret science" to advance its regulatory agenda. Smith, one of the leading opponents of mainstream climate science in Congress, has repeatedly accused federal climate scientists of engaging in a massive conspiracy to falsify climate data. And he has repeatedly introduced bills that would require EPA to publicize data it uses when crafting regulations. Those efforts died when President Obama was in the White House, and Smith's newest legislative push doesn't appear to be moving even though Republicans control both chambers of Congress. The House passed a bill dubbed the "Honest and Open New EPA Science Treatment (HONEST) Act" — requiring that EPA rules be based on science for which underlying data is publicly available and reproducible — last March. But the measure has gone nowhere since it was referred to the Senate Environment and Public Works Committee. Smith has tried to push the idea elsewhere, too. In comments on the 2019 budget proposal, the GOP majority on the Science panel led by Smith suggested that EPA's funding should be contingent on the administrator's "requiring that all scientific and technical information and data relied on to support a risk, exposure, or hazard assessment; criteria document; standard; limitation; regulation; regulatory impact analysis; or guidance issued by the EPA is made publicly available." Critics on the left and in the scientific community see the effort as an attempt to hinder EPA from issuing rules. "A lot of the data that EPA uses to protect public health and ensure that we have clean air and clean water relies on data that cannot be publicly released," said Yogin Kothari with the Union of Concerned Scientists. Many scientific studies rely on data that can't be made public for reasons like patient privacy concerns or industry confidentiality. "If EPA doesn't have data to move forward with a public protection for a safeguard, it doesn't have to do that at all," said Kothari. "It really hamstrings the ability of the EPA to do anything, to fulfill its mission." Publishing raw data also opens scientists up to attacks from industry, which can twist or distort data to shape a deregulatory agenda, said Betsy Southerland, a former senior EPA official in the Office of Water who worked on a staff analysis of the "HONEST Act." Southerland, who left EPA last summer, said the effort is deceptive and is not about transparency, but about sidelining peer-reviewed science that supports regulation of pollution. She said there are numerous examples of groundbreaking studies that are not replicable, such as human health studies after the dropping of atomic bombs in Hiroshima or the ecological effects of the BP PLC Gulf of Mexico oil spill. In many of the older studies, there are a plethora of people, including some who are dead, who could no longer be tracked down. "This is just done to paralyze rulemaking," she said. "It's another obstacle that would make it so hard and so difficult to go forward with rulemaking that in the end, the only thing that would happen — in the best case you would greatly delay rulemaking; in the worst case you would just prevent it. It would be such an obstacle you couldn't overcome it." Publicizing the data in some EPA actions, which often come after years of research, could be extensive. For example, risk assessments for certain chemicals sometimes cite hundreds or even thousands of studies, all of which would have to be tracked down for data collection, according to the EPA analysis of the "HONEST Act." Requiring data transparency would cost hundreds of millions of dollars because it would require EPA staff to track down data from study authors and create an online management system to store and present those data, the analysis found. In addition, EPA staff would have to spend time redacting personally identifiable information in the studies, and study authors would likely require payments for preparing and sending their data. EPA career staff estimated that Smith's legislation would add $250 million in costs annually for the first few years after it was implemented, Southerland said. That estimate was dismissed by senior EPA officials who said those costs were inflated and that the agency would not use many studies to which the rule would apply, but they did not provide evidence, she said. EPA's analysis of Smith's bill was published by the radio program "Marketplace." Milloy, who has long pushed for EPA to stop issuing regulations unless the underlying scientific data are made public, said the science reform effort could be done through a directive, in the same way that Pruitt reshaped EPA's science advisory panels. The overhaul of those committees is another area where Pruitt came through on one of Smith's longtime priorities. In October, Smith was seated front and center at an event where Pruitt announced that he would reform the advisory panels to bar researchers who take government funding. 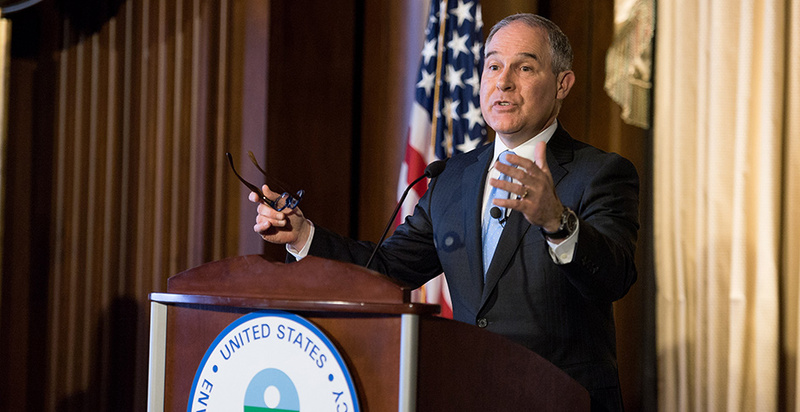 Critics said that move skewed the advice EPA is getting by making it tough for researchers who rely on public funding to participate, but keeping industry-funded scientists on board. Pruitt then appointed as science advisers a number of researchers whose work is funded by industry, energy lobbying groups and conservative think tanks, while forcing out academics from major research institutions. "Pruitt did a great job in cleaning up the science advisory boards, and if he does that kind of work on this, that's fantastic," Milloy said of the expected science data reform effort. "My goal is to make sure EPA does not rely on scientific studies unless the data is made available for replication by somebody." Kothari of the Union of Concerned Scientists called it "alarming" that the Trump administration's science agenda "is being run by the chairman of the Science Committee, given that he has continued to not care about how science informs policymaking." "This is the second thing now that this administrator will be implementing based on legislation that was never enacted," Kothari said. "It's just another excuse for Pruitt's EPA to really abrogate EPA's responsibility to protect human health and the environment."